Frontload containers are used for general garbage, construction waste as well as paper and cardboard recycling. Frontload containers can be used for various projects. Note: Shingle bins available in 4yd size only. Who would require a 3, 4 or 6 yard overhead bin? What items cannot go into the frontload container? Heavy pieces of steel, metal or iron. Lumber and wood products are acceptable if cut down to size. What do I do with the above items that cannot go into my bin? Call Prairie Disposal Ltd’s and we can assist with the removal and dispose of any item(s) in a safe and environmentally fashion. 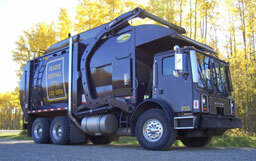 Prairie Disposal Ltd provides Roll-Off containers for the commercial, residential and acreage customers. The roll-off container division includes waste disposal bins in a variety of sizes including 12, 20, 30 and 40 yard bins. 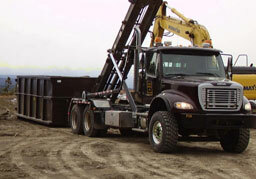 Prairie Disposal Ltd has specific types of containers used for oilfield, recycling, and concrete/pavement removal. Who would require roll-off containers?